January 2000 — Will winter this year be colder and snowier than usual? Should farmers anticipate droughts or floods next spring? Will the fall hurricane season likely be more or less fierce? Should officials conserve water, stock up on fuel, or import grain now to prepare for potential climate conditions a few months hence? We are on the brink of being able to answer those questions with a high degree of accuracy. But to do that, we can’t just look to the atmosphere. We need to look to the ocean. Over the past decade, our evolving understanding of the El Niño/Southern Oscillation (ENSO) has revealed how the ocean and atmosphere are intimately linked in a dynamic exchange of heat, moisture, and momentum that generates our climate. But while fast, ephemeral phenomena in the atmosphere produce storms, cold snaps, tornadoes, and other day-to-day events that comprise the weather, the oceans move at a much more lumbering pace. By storing and transferring vast amounts of heat around the planet, the oceans create the underlying conditions that—over seasons, years, or even decades—make broad global patterns of rainfall, winds, storms, and atmospheric circulation more or less likely to occur. With ever-increasing accuracy, meteorologists have been able to produce three- to five-day weather forecasts. That helps one decide whether to carry an umbrella on Tuesday. But South American farmers—wavering between planting rice (which requires lots of water) or cotton (which doesn’t)—would profit greatly if they knew that the coming growing season on average would likely bring more or less rainfall. The best efforts of humankind have always been humbled by the unexpected vicissitudes of our planet’s climate. Droughts cause famine, forest fires, epidemics, mass migrations, even wars. Floods, extended heat waves and cold periods, and other short-term climate shifts wreak their own havoc. Oceanic shifts by themselves can dramatically affect fish populations, disrupting an important industry and food source. In all these cases, a little advance warning offers a potential means to reduce or avoid human and economic devastation. To make their forecasts, meteorologists rely on an extensive network of land-based stations and satellites that collect daily measurements of atmospheric temperatures, humidity, and winds. To predict climate as accurately as we now can forecast the weather, we require a network to monitor global ocean conditions as thoroughly as we monitor worldwide atmospheric conditions. That’s the motivation for the Argo program—a Johnny Appleseed-like proposal conceived by an international team of scientists to disperse 3,000 floating buoys throughout the world’s oceans. 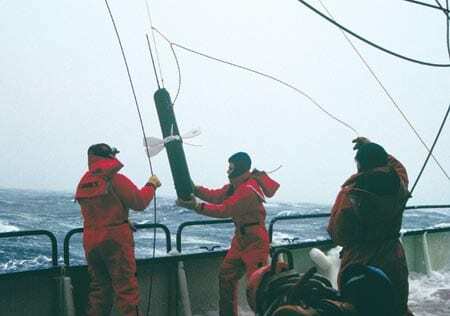 Equipped with sensors to monitor fluctuating temperature and salinity in the upper layers of the ocean, Argo buoys will relay data via orbiting satellites in near real time to shore-based laboratories. Together with satellite and other available data, the Argo observations will be used to make “weather maps” of the ocean, to feed computer climate forecast models, and to improve our understanding of the ocean itself. 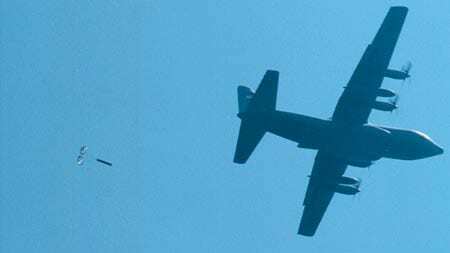 Argo is the result of more than two decades of research and development in float technology sponsored by the National Science Foundation (NSF) and the Office of Naval Research (ONR). In the United States, scientists and engineers at Woods Hole Oceanographic Institution, Scripps Institution of Oceanography, and Webb Research Corporation in Falmouth, Massachusetts, have led efforts to design, build, and test the floats. They are designed to sink to depths of 2,000 meters (slightly more than a mile), drift with ocean currents at that depth for ten days, and then rise to the surface, measuring the temperature and salinity of ocean layers along the way up. On the surface, the floats radio their data and positions to satellites before returning to depth and continuing another cycle. The satellites will relay Argo data to land-based receiving stations and then to scientists and forecast centers in near real time. The data will be openly available, without proprietary restrictions. Computer model simulations have shown that the floats will not clump, but rather will go with the ocean’s flow, maintaining a separation of a few hundred kilometers from each other. 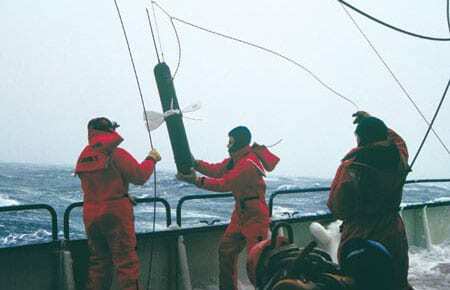 Argo floats can be dropped overboard by hundreds of commercial vessels that ply trading routes across the globe, or parachuted by airplanes to seed remote ocean regions. They can continue to operate unattended over a design life of four to five years. Argo was the ship of the mythological Greek hero Jason, and the program’s name stresses the close connection between the floats and the Jason-1 satellite, a collaboration between the National Aeronautics and Space Administration (NASA) and the Centre National d’Études Spatiales (CNES, the French Space Agency). Jason-1 will be launched late this year to continue measurements of global sea level initiated by the NASA/CNES TOPEX/Poseidon satellite in 1992. Other satellites operated by NASA, the Japanese Space Agency, and the National Oceanic and Atmospheric Administration (NOAA) measure sea surface temperatures and the speed and direction of winds blowing over the oceans. These satellites will complement the Argo floats, which, unlike the satellites, can observe beneath the surface. Subsurface measurements are essential because the ocean’s upper layers can store 1,000 times more heat than the atmosphere does. Changes in subsurface currents, temperature, and salinity eventually change conditions at the surface, where the ocean interfaces with the atmosphere. When an El Niño occurs, for example, a great mass of warm water, usually pooled in the western Pacific, spreads eastward, accumulating off the west coast of the Americas. At the same time, prevailing trade winds diminish, rearranging global atmospheric circulation patterns and worldwide weather. Rain clouds, for example, accompany the warm waters eastward, taking rain from places where it is expected and dropping it unexpectedly in others. As recently as 1982, scientists were unaware that one of the most powerful El Niños of the century was forming with inevitable and catastrophic momentum. It sparked climatic changes that caused devastating droughts and fires in Australia, flooding in normally arid regions of Peru and Ecuador, unusual storms that rearranged California beaches, and widespread mortality of fish and bird life. All told, it led to thousands of deaths and an estimated $13 billion in damage. In the aftermath of this disastrous El Niño, NOAA, NSF, and international partners began to deploy an extensive observing system—moored instruments, surface drifting buoys, and Volunteer Observing Ships—to monitor oceanic conditions spanning 10,000 miles of the equatorial Pacific. These complement NASA, NOAA, French, and Japanese satellites that track shifting winds and sea levels. Completed in 1994, this ENSO Observing System provides a continuous stream of real-time observations to forecast the development, strength, and duration of El Niños and La Niñas, a cooling of eastern Pacific waters that sometimes follows an El Niño episode and causes its own set of weather conditions. The monitoring system provided advance warning of the powerful 1997–98 El Niño, which helped save an estimated $1 billion in California alone. Building on this success in unraveling ENSO, meteorologists and oceanographers have begun to identify a host of other ocean-atmosphere oscillations operating in the earth’s climate system: the North Atlantic Oscillation, the Arctic Oscillation, the Antarctic Oscillation, the Pacific Decadal Oscillation, the Indian Ocean Dipole, and the Antarctic Circumpolar Wave. Shifting over months or decades, each is associated with different climate changes in different parts of the globe in quasi-periodic, but potentially predictable ways. The Argo program offers a means to gather the consistent, long-term, observations within the upper layers of the global ocean needed to reveal the ocean’s role in these newly identified climate oscillations and to incorporate their effects into climate forecasts. Once fully deployed, Argo and its satellite partners will give us for the oceans what meteorologists have had for the atmosphere—a worldwide observing network and the potential to forecast our climate six to 12 months in advance. More information on the Argo program is available at: www.argo.ucsd.edu. The Argo program proposes to disperse 3,000 floats, like the one below, throughout the oceans to collect data on oceanic conditions that can be periodically transmitted to shore via satellite. The principal components of an Argo float. Each float sinks to depths of 2,000 meters, drifts with ocean currents for ten days, rises to the surface taking measurements along the way, and then transmits data back to shore via satellite.